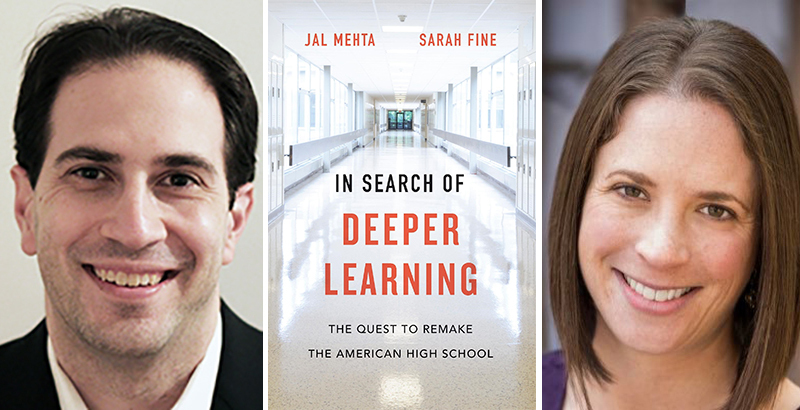 Excerpted from In Search of Deeper Learning: The Quest to Remake the American High School by Jal Mehta and Sarah Fine, published by Harvard University Press. Copyright © 2019 by the president and fellows of Harvard College. Used by permission. All rights reserved. It wasn’t until we stepped outside for a mid-afternoon break that the doubts became too serious to ignore. On the surface, all was well. Our flights were on time. The West Coast weather was sunny and warm — a welcome respite from the New England winter. Adults and adolescents at Inspire Academy (a pseudonym) were gracious. Leaders took the time to talk with us; teachers welcomed us; students didn’t balk when we joined them at lunch. When we said that we had come to Inspire as part of our research on how American high schools could create powerful learning experiences for more students more of the time, people nodded knowingly. Their school, they told us, was leading the charge on that front — using project-based learning to support students in developing both deep academic knowledge and “twenty-first century skills” such as collaboration and creative problem-solving. There was one bright spot. In Ms. Ortiz’s eleventh-grade English classroom, tucked away in an upstairs corner of Inspire’s sprawling building, students had spent a month reading and analyzing Kate Chopin’s The Awakening. Now, drawing on the themes from the novel, they were working on a project that asked them to use original art to challenge narratives they found oppressive. The room hummed with purposeful activity. Some students clustered around tables, immersed in their creations, while others worked on the accompanying written analyses. When we asked them to discuss their work, they did so thoughtfully and articulately, explaining how, unlike Chopin’s protagonist, who saw suicide as the only escape from society’s expectations, they were using art to challenge the narratives they saw as constraining. Next week, they would exhibit and explain these creations to an audience of peers and teachers. As we sat on a patch of grass near the school’s front entrance, we compared notes and tried to work through the questions that were bubbling up. Why were there such gaps between Inspire’s espoused values and its enacted practices? How could a school that had been recommended as a leader in the field — in foundation-commissioned case studies and by many educators and reformers — so dimly resemble its reputation? How did Ms. Ortiz learn to do what she did, and why was Inspire unable to spread such effective practices to more of its teachers? Was Inspire really among the best the United States had to offer when it came to engaging underserved high school students in powerful learning experiences? If it was, what did that say about our project — and about our field? These were not the questions that had brought us to Inspire. We began 2010 in an optimistic frame of mind, having secured a small grant to study a range of successful American public high schools — particularly, but not exclusively, those serving disadvantaged students — and try to understand what made them tick. In an era when standardized testing reigned supreme, we wished to question the logic that labeled “good” schools as those whose students did well on tests, and instead study places that were not merely achieving academic minimums but helping students to flourish — to think critically, to become engaged in their learning, and, in a variety of ways, to prepare for the demands of twenty-first-century life. Since we suspected that the answers to these questions might be multiple rather than single, we wanted to capture a variety of different approaches to achieving these goals. We would visit schools that varied widely in pedagogical approaches, governance, and design, including traditional comprehensive high schools, charter schools, magnet schools, pedagogically traditional and pedagogically progressive schools, urban schools, and suburban schools. Our plan called for us to immerse ourselves in these places using ethnographic methods—observing classes, talking with teachers and students, examining artifacts — to try to understand the varied approaches to bringing public high schools into the modern age. The timing for such a study was ripe. While there had been a spate of studies on high schools in the 1980s — captured in classic works such as Sizer’s Horace’s Compromise, Lawrence-Lightfoot’s The Good High School, Powell et al.’s The Shopping Mall High School, and Goodlad’s A Place Called School — shifting trends in scholarship had moved away from the kind of holistic and humanistic perspectives that characterized this well-known work. In addition, the creation of charter schools in the early 1990s, along with the small school movement in the late 1990s and early 2000s, meant that there was now a much greater range of institutions to study. We also wanted to tap into the increasing public desire to improve high schools, which many had come to see as the final, and most challenging, frontier of K–12 school reform. While there has been some progress in student achievement in math and reading in fourth and eighth grades over the past several decades, high school achievement in math and reading in the United States has been flat. The International PISA test, which asks high school students not only to recall information but also to apply knowledge and problem-solve, consistently places the United States at the midpoint, or lower, of international rankings. Data also consistently demonstrate that the longer students are in school, the less engaged they feel: 75 percent of fifth graders feel engaged by school, but only 32 percent of eleventh graders feel similarly. Since this range of indicators suggested that high school continues to be the hardest place to make progress, we were hoping to study “break-the- mold” high schools to understand what it would take to create engaging, equitable, and intellectually vibrant learning environments for all adolescents. The problem was finding such schools. Inspire was not an exception. At school after school, as we shadowed students through their days, we found gaps between aspirations and realities. Most classrooms were spaces to sit passively and listen. Most academic work instructed students to recall, or minimally apply, what they had been told. When we asked students the purpose of what they were doing, the most common responses were “I dunno — it’s in the textbook,” and “maybe it’ll help me in college.” We had seen such lackluster classrooms before, of course, but these were in highly recommended schools where we had hoped to find a model that would transcend the norm. All too often, things looked the way they had at Inspire: big ambitions and significant struggles. So, what to do? One option was to abandon the project. There would be some funding wasted and some time squandered, but, perhaps, better to accept the sunk costs and move on. A second option was to turn our project into an indictment of the American education system. In the tradition of Jonathan Kozol, John Holt, Charles Silberman, and many others, we could write a scathing critique of American schooling, drawing on our observations to show the ways in which even schools that were meant to be innovative were falling far short of their aspirations. But this ground had been covered many times over — and part of why we wanted to write about good schools was that we sought an antidote to the pessimism that governs so many school reform discussions. As we looked more closely at our data, we realized that there might be a third option. While the dominant patterns we had observed reflected a school system that was trapped by a “grammar of schooling” that was cast a century ago, there were exceptions — many different kinds of exceptions — which, cumulatively, perhaps could help to light a path forward. Often these exceptions were in classrooms, like Ms. Ortiz’s, where teachers had found interesting ways to engage students in intellectually complex subjects. If the bad news was that our recommended schools, as a whole, were struggling to achieve their ambitions, the good news was that at every site we found individual teachers who had found ways to transcend the norm. In fact, it became a predictable part of our research: if we spent a day shadowing a student, we would find one and sometimes two classes that were intellectually lively and demanding. Over time, these classrooms became their own data set. What were these teachers doing, how were they doing it, and how had they come to do it? There seemed to be much to learn from them. Another bright spot came from widening our view. In many of the high schools we visited, much of the most powerful learning seemed to occur not in core classes, but rather at the school’s “periphery” — in electives, clubs, and extracurriculars. Hidden in plain sight, these peripheral spaces often had a very different “grammar” than the one that usually dominated core classes. In these spaces, students had real choices, learning by doing was the norm, there was time to explore matters in depth, and students were welcomed as producers rather than receivers of knowledge. What made these spaces tick? How could they exist, almost entirely unnoticed, within the same schools in which core learning was so often passive and disengaged? Might there be lessons that the “core” could learn from the “periphery”? Finally, as we continued our search, we did find a small number of high schools that consistently were able to translate their espoused values into enacted practices. In particular, we identified three very different schools — a project-based school, a “no excuses” school, and an International Baccalaureate-for-all school — that were able to actualize their visions in powerful ways. What enabled these schools to make such headway? How had they countered the classroom-to-classroom variation in quality that was so prevalent elsewhere? Why were administrators and teachers in these places able to achieve their aspirations when many with similar ambitions could not? Viewed this way, our experiences at Inspire and other struggling schools became useful data: contrasting cases that could be lined up against our positive cases to help us identify exactly what enabled some schools to transcend the norm. The profound differences across these three schools also allowed us to explore a range of approaches to the remaking of the American high school. During the course of our study, educators and scholars began to refer more and more often to “deeper learning,” an umbrella term evoking a range of ambitions that extends beyond rote learning. These goals were not exactly pathbreaking — many schools, particularly private schools, had embraced such ambitions for years — but the idea of bringing them to all students would be new. We saw close relationships between our study and the notion of deeper learning. In fact, as we considered it further, we realized that these three schools were each working on different parts of the deeper learning equation. The no-excuses school, which we call No Excuses High, was particularly focused on the challenge of equity; its leaders were trying to take the type of traditional learning that is often found in the upper tracks of affluent schools and make it available to high-poverty students of color. The project-based school, which we call Dewey High, was focused on reimagining the grammar of schooling — on breaking down barriers between disciplines, on connecting the school to the broader world, and on having students create and contribute knowledge rather than just passively receive it. The IB school, which we call IB High, lay somewhere in the middle: drawing on an examination system created for highly privileged students, the schools’ administrators and teachers were striving to help students do authentic work within the traditional academic disciplines, while simultaneously seeking to extend such learning to a wide array of learners. These schools, then, provided three distinct visions of what the reinvented high school might look like, each with corresponding advantages and trade-offs. If these high schools offered starkly divergent possibilities for the future of schooling, we were also coming to recognize that our most successful teachers, electives, and extracurricular spaces, wildly varied as they were in methods, goals, and populations, all held one trait in common: they integrated different virtues of learning. In particular, we came to think that our own distinct vision of deep learning — not simply in school, but in life — emerges at the intersection of three virtues: mastery, identity, and creativity. In the spaces that teachers, students, and our own observations identified as the most compelling, students had opportunities to develop knowledge and skill (mastery), they came to see their core selves as vitally connected to what they were learning and doing (identity), and they had opportunities to enact their learning by producing something rather than simply receiving knowledge (creativity). Often these spaces or classrooms were governed by a logic of apprenticeship; students had opportunities to make things (newspapers, collections of poetry, documentary films, theater productions, debate performances) under the supervision of faculty and/or older students who would model the creative steps involved, provide examples of high-quality work, and offer precise feedback. Not coincidentally, the most successful teachers and extracurricular leaders whom we encountered had themselves been apprenticed into their fields in a similar way — and these experiences had helped them develop a stance about what they were doing that differed from the “teaching as transmission” view that was so prevalent. We widened our lens in other ways, too. While we initially planned to write about schools, it became impossible to make sense of what we were seeing without considering the interplay of external forces that had shaped these schools. For example, Inspire and schools like it were working against the grain in so many respects: most teachers were teaching as they had been taught, short class periods inhibited in-depth explorations, district-mandated curricula and teacher evaluation systems were not aligned with efforts to emphasize critical thinking, and parental and college pressures mitigated against change. In fact, we came to think that many of the most successful classrooms, extracurriculars, and schools that we encountered were successful because they had found ways to buffer the expectations of the external ecosystem in order to create space to do something different. Thus, when we began to write about particular schools and learning spaces, we tried to move back and forth between describing practices on the ground and considering the broader forces that shape or constrain those practices. As we drafted our conclusion, we considered how these forces might be transformed to support, rather than inhibit, powerful efforts on the ground. The good news is that there seems to be a growing interest in making these shifts. When we began in 2010, this project felt far outside of the mainstream; the attention of both the public and the K–12 world was still focused on the test-score emphasis of No Child Left Behind. During the intervening years, however, there has been a distinct shift. The Common Core State Standards initiative signaled a focus on more ambitious learning goals; policymakers and practitioners increasingly started talking about “twenty-first-century skills”; the Obama White House held a summit on high school reinvention; XQ: The Super School Project ran a nationwide competition to reinvent schools; High Tech High, a network of project-based schools in San Diego, now attracts more than a thousand practitioners to its annual Deeper Learning conference; and deeper learning is now part of many state and district policy strategies. At the beginning, we struggled to find funding for the project; now, we find ourselves increasingly invited to address gatherings of educators seeking to undo old systems and create powerful learning environments for the future. And while part of what motivated our research was the middling performance of U.S. schools on international yardsticks, many of those who attend our sessions come from other countries — they too, are trying to figure out how to integrate mastery, identity, and creativity into a twenty-first- century school system. In the end, we visited thirty schools, spent more than 750 hours observing classrooms and other learning spaces, and interviewed more than three hundred students, teachers, administrators, parents, and other stakeholders. The picture that emerged is of an institution that is betwixt and between when it comes to deeper learning. Schools are actively trying to shed the long hand of the past, but have not yet arrived at the future. This effort is truly a quest: a journey that, as yet, has no clear path — but whose stakes make it well worth undertaking. This is not the book we set out to write. We were seeking inspiration; we found complexity. Our friend and colleague Marshall Ganz, who teaches organizing, says that significant change is about urgency combined with hope. The story we tell here has elements of both. On the one hand, our research underscores the difficulty of deepening the work of most American high schools, given that their core designs are often unspecified and/or incoherent, and that their core programs of academic study are often fundamentally disconnected from who students are and what they can do. In documenting these realities, we try to show, in unvarnished terms, the size of the problem; we argue that the change needed at scale is more one of kind than of degree. On the other hand, we show that there are already many classrooms, electives, and extracurriculars, as well as a few individual schools, that can light the path, showing what powerful and purposeful learning would look like. With humility, we suggest that if we wish to be neither paralyzed by the scale of the problem nor seduced by the promise of easy solutions, we need to look carefully at exactly what makes this work so hard — and also at why, and under what conditions, it is possible to achieve success. Our hope is that by sharing what we’ve learned we can spark an informed conversation about what it would entail to build a system in which deep learning is no longer the exception, but the rule.